A large percentage of the average person’s waste comes from the kitchen, including food, packaging and water. Reduce your kitchen waste using these simple steps and you’ll be sure to see a difference in no time. The first place to start reducing your kitchen waste is while shopping for groceries. Always take your own reusable grocery bags to the store to reduce the demand for plastic bags. Buy your non-perishable items in bulk to cut down on packaging. Choose items that come with less packaging so there is less for you to toss out. Also consider taking a list with you to cut down on multiple trips to the store. Once you’ve successfully cut down on the waste produced from shopping, look around your home for other unique ways to reduce your carbon footprint. Try planting a garden and growing some of your own food. You can cut down on purchasing produce and herbs by growing your own. Fresh from your garden trumps store bought every time for quality and taste. Now consider cutting down on food waste. Only prepare what you need for each meal or freeze leftovers to extend their shelf life. Don’t throw away food scraps and peelings, instead compost it into a nutrient-rich soil for your home garden. Some common items from the kitchen that you can add to a composter include coffee grounds and filters, tea bags, egg shells, toothpicks, bamboo skewers, expired milk, stale beer and even shredded pizza boxes. Also consider eliminating the use of disposable products in the kitchen. 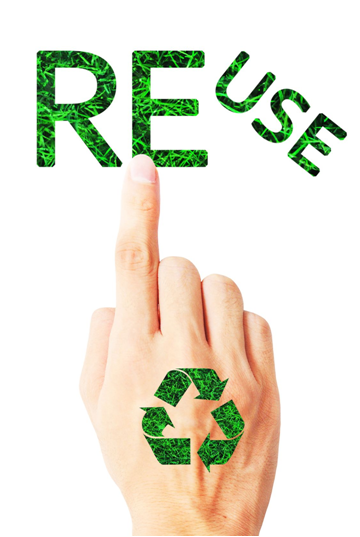 Do your best to live without disposable goods like paper towels, paper plates and plastic cups. Use reusable containers instead of plastic wrap or aluminum foil for leftovers. You can also reduce water usage in the kitchen. Use a bowl of water and a brush to wash fruits and vegetables instead of running water. When hand washing dishes, you can pile them in the sink and rinse them all at once instead of keeping the water running. Only run the dishwasher when it’s completely full. 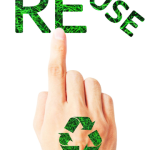 Learn more about going green and cutting down on waste at our eco-blog today. You can also browse our selection of reusable grocery bags that you can customize and order in bulk for promotional and marketing purposes.